A look at upcoming stand-out lots in poster sales held around the world, along with a round-up of recent highlights – including a hammer horror classic sold by a London dealer and an Edward Wadsworth design at a Dorset auction. Edward Wadsworth dazzle poster from 1923 which is estimated at £20,000-25,000 in Onslows' auction on December 14. Edward Wadsworth (1889-1949) was influential in an abstract art movement led by the Vorticist Wyndham Lewis. The woodcuts he made during the First World war depicting dazzle camouflage are now sought after by collectors and are regarded as some of his finest work. Wadsworth had been employed by the Admiralty to supervise the camouflaging of many ships during the First World War. The experience led to his Dazzle ships art work. A classic example is coming up at Dorset saleroom Onslows in the Vintage Posters auction on December 14, estimated at £20,000-25,000. The poster crosses over into the market for rare British prints and woodcuts. It has a provenance of Paul Rennie Collection before 2010, sold at Christie’s South Kensington on May 13, 2010, acquired by a London-based archive. 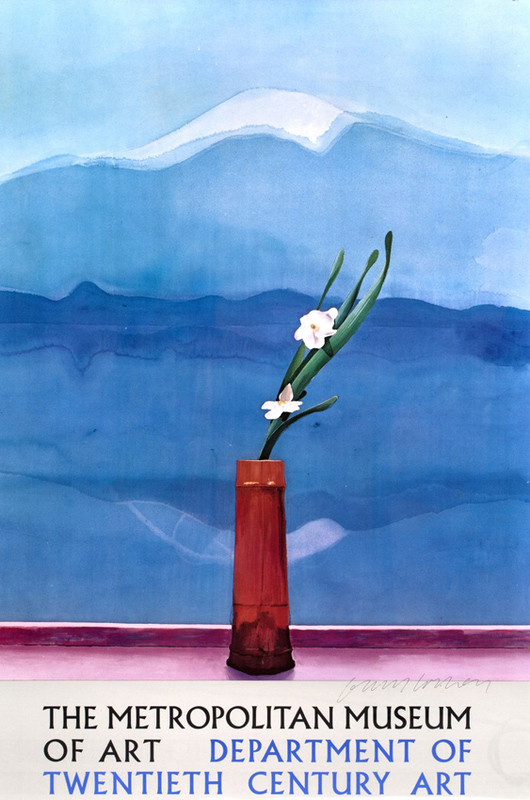 David Hockney-designed poster estimated at £200-300 in the Mallams Oxford auction on December 6. Your pockets may not have been quite deep enough to buy David Hockney’s 1972 work Portrait of an Artist (Pool with Two Figures) which made $80m (£61.6m) at Christie’s New York on November 15 – the most expensive work by a living artist. However, Mallams Oxford is offering a selection of Hockney-designed posters in its Design & Modern British and Post-war Art auction on December 6 at probably more affordable prices, such as the lithograph poster shown here, estimated at £200-300. For The Metropolitan Museum of Art, Department of Twentieth Century Art, 1981, the poster is signed in pencil lower right and measures 3ft x 2ft (90 x 60cm). Provenance: Christie’s London, Hockney Posters, March 25, 1999. Qantas poster estimated at $250-350 at Potter & Potter Auctions on December 1. Over the Pond from these first two, as part of its 750-lot Vintage Travel Poster Sale on December 1, Chicago saleroom Potter & Potter Auctions says its latest auction “offers a grand tour of European cities”. Top dog when it comes to the destination of London is a wonderful British travel poster featuring an English bulldog on a blue background with a jet above. This c.1960 poster for Qantas was designed by Australian Harry Rogers (1929-2012) and is estimated at $250-350. Toulouse-Lautrec lithograph estimated at $5000-7000 at the Gray's Auctioneers sale on December 5. Sticking with the US, on December 5 Cleveland firm Gray’s Auctioneers is holding a Fine Art, Estate jewellery and Decorative Art sale and among the 400 lots is a coloured lithograph titled Babylon d’Allemagne par Victor Joze. 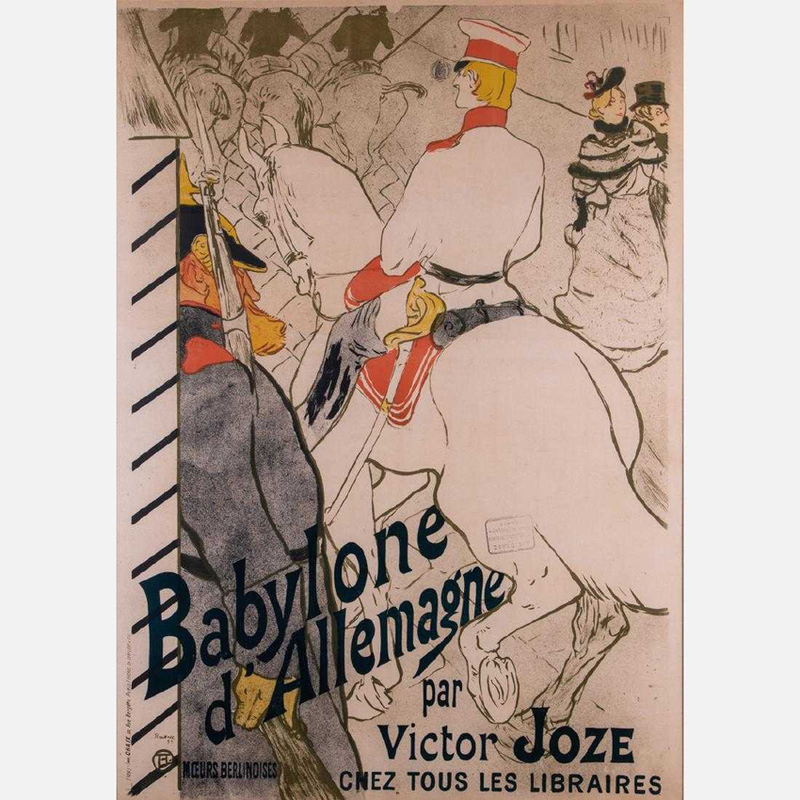 This work by Henri de Toulouse-Lautrec (1864-1901) was commissioned to promote the release of the novel Babylon d’Allemagne by the French author Victor Joze. Toulouse-Lautrec is best known for his depictions of Parisian nightlife, but he also did promotional posters for book releases. 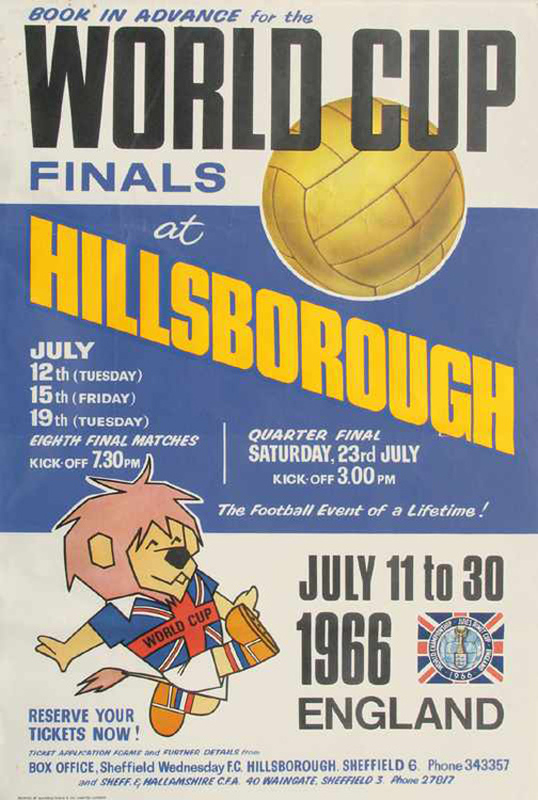 England 1966 World Cup poster for games at Hillsborough, on offer estimated at €300 in the December 7-8 Agon sale in Kassel, Germany. This 2ft 6in x 2ft 5in (75 x 73cm) design is a large official poster for the 1966 World Cup, also held in England. It promotes games held in Sheffield, at ‘Hillsborough July 11 to 30 1966 England’. It comes from the estate of a German Football Association (Deutsher Fussballbund – DFB) official. The Kassel auction house has estimated it at €300 in the December 7-8 sale. Germany/West Germany do have four World Cup wins, of course. 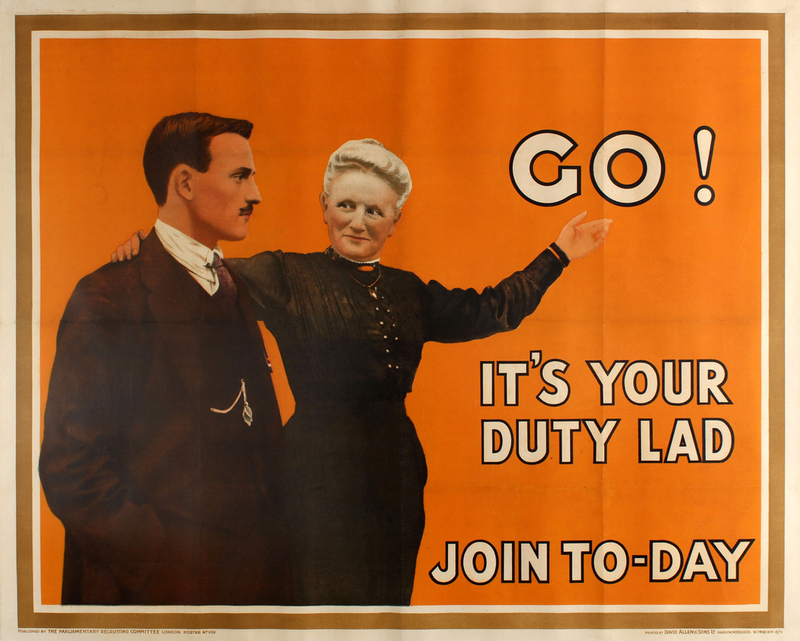 First World War British recruitment poster sold for £240 at the Antikbar November 10 auction. Propaganda posters were a notable feature of the First World War and this collecting field has also produced many stand-out lots sold in various auctions marking the Armistice centenary this year. Poster specialist Antikbar of west London included about 60 Great War designs in its Original Vintage Posters auction on November 10. The British Expeditionary Force was manned by volunteers in 1914 as the war began but by 1915 is was obvious this would be a long slog and many more would be needed (with conscription becoming necessary in Britain a year later). Typical among the emotive – and guilt-inducing – recruitment posters exhorting young men to serve their country was the 1915 image shown above. This features a smiling lady wearing a black dress and a younger man wearing a smart suit, the lady with one arm around the man's shoulders in a motherly fashion pointing to the word Go! with her other hand, the bold message in white and black outlined letters against the orange background reading: Go! It's your duty lad Join to-day. The large, 4ft 2in x 3ft 4in (1.27 x 1.01m) poster was published by the Parliamentary Recruiting Committee London, Poster no109, printed by David Allen and Sons in Harrow, Middlesex. It sold for a mid-estimate hammer price of £240. 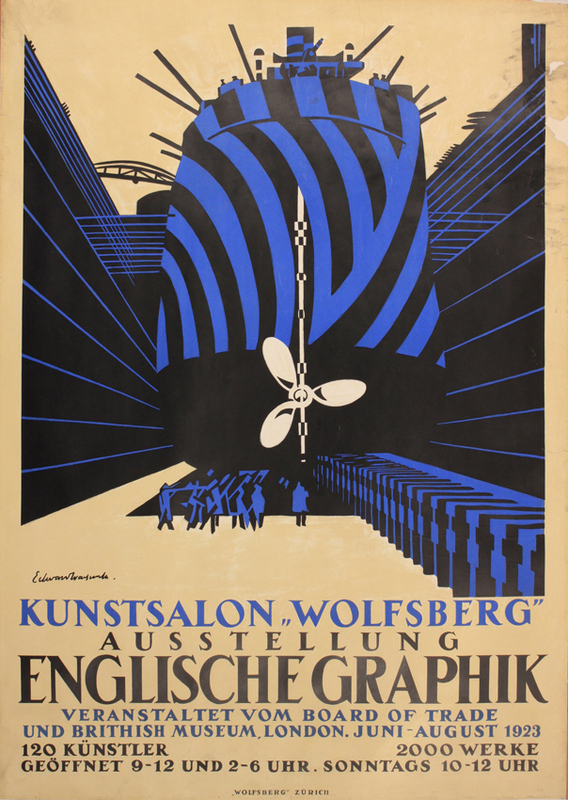 Philip Zec LMS travel poster sold for a premium-inclusive $17,500 by Swann of New York. New York’s Swann Auction Galleries is noted for its poster selections and the saleroom says that eight records were set in its Rare & Important Posters sale on October 25. 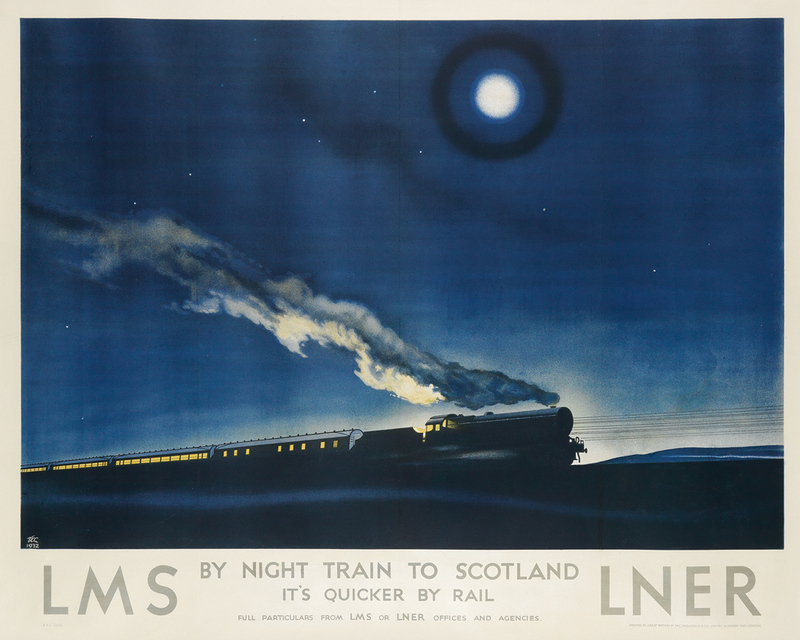 One of the top lots was a stylish British Art Deco-inspired poster by Philip Zec promoting the London Midland & Scottish railway’s night train to Scotland, sold for a premium-inclusive $17,500. The fourth of the 11 children of Simon Zec, a Russian tailor, Philip Zec was born in London in 1909. He attended St Martin's School of Art. He became a leading illustrator in Britain and his later anti-Nazi cartoons in the Daily Mirror were very popular. However, he could also annoy the government, especially with his 1942 cartoon The price of petrol has been increased by one penny. It showed a torpedoed sailor with an oil-smeared face lying on a raft and led to Zec being investigated by MI5 for subversion. Original artwork for Breaker Morant film poster designed by Brian Bysouth sold in the Prop Store November 20 auction for £6500. The Prop Store is a firm based in London and Los Angeles selling movie collectables. Its latest cinema posters auction on November 20 included sought-after examples from James Bond and Star Wars, but a surprise stand-out lot came in the form of original artwork for a much less familiar film. 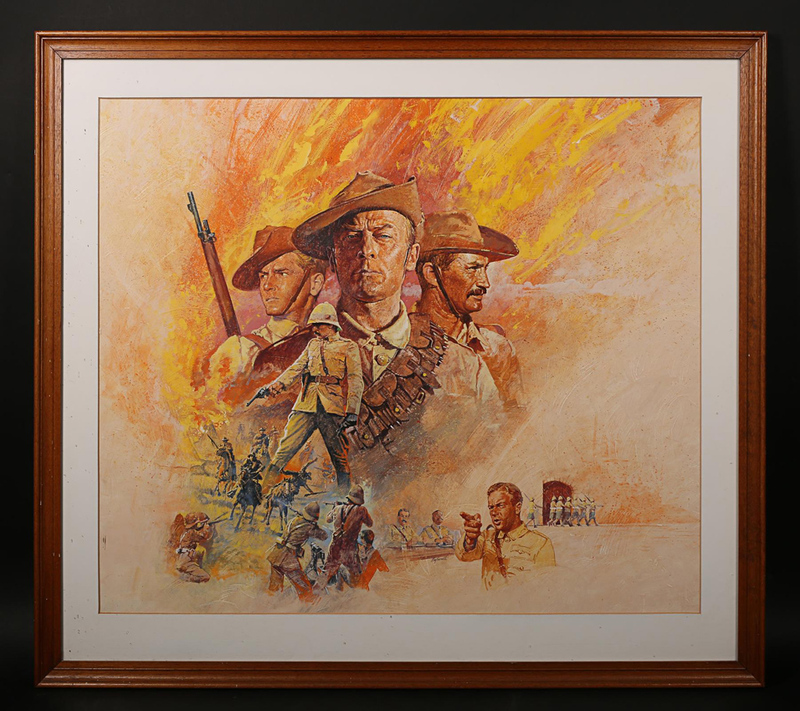 The final framed and glazed painted artwork for the Quad poster for the Australian military drama Breaker Morant (1980) sold for a whopping hammer price of £6500 against an estimate of £600-700. It is signed by the artist, Brian Bysouth. Starring the likes of Edward Woodward and Bryan Brown, the film was set during the Boer War and recounted a tale of war crimes, subterfuge and colonial oppression. This 2ft 8in x 3ft (81 x 91cm) image is a rare example of a piece of Bysouth artwork available in the market. He became one of Britain’s foremost cinema poster artists and built an impressive roster of striking poster designs including Raiders Of The Lost Ark, Big Trouble In Little China, Highlander and the very last James Bond poster to feature original painted artwork: The Living Daylights. Classic hammer horror Dracula poster sold for a sum in excess of £20,000 by specialist dealer Picture Palace Movie Posters. Horror is one of the top genres for poster collectors, especially the Hammer Films and early examples. 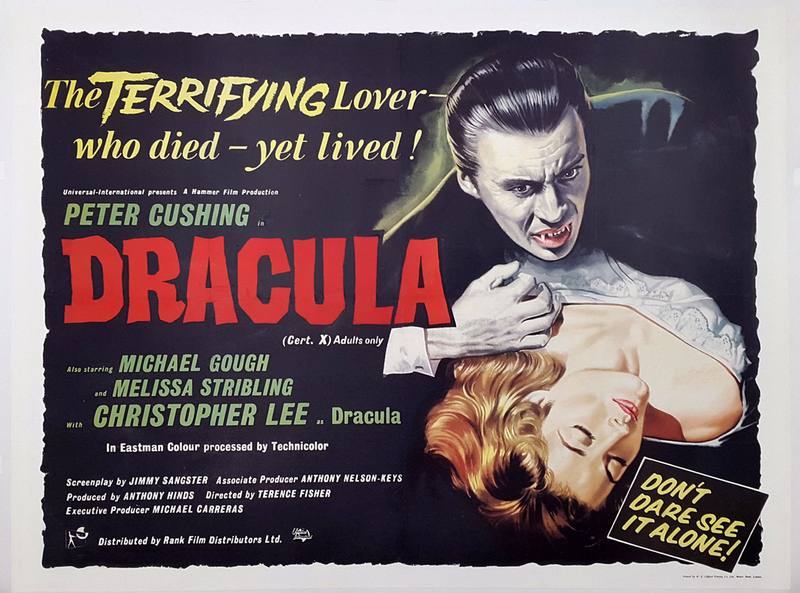 Specialist dealer Picture Palace Movie Posters, based in Wimbledon, recently sold a rare UK quad for Hammer Films’ Dracula (1958), starring Christopher Lee in his first outing as Bram Stoker’s infamous vampire count. Reflecting that demand, it went for a price in excess of £20,000 to a European collector. It was one of more than 150 posters featured in the gallery's latest catalogue Hammer Shock: Posters from the Golden Age of British Horror (1945-75), with a foreword from renowned horror author Jonathan Rigby. Picture Palace owner Mark Barrow says: “It’s one of the most iconic and sought-after British posters of the last 60 years, with stunning artwork by Bill Wiggins. They are very scarce, with perhaps maybe only a dozen or so in existence, so it’s a very desirable must-have poster for any serious collector"
The firm specialises in original vintage film posters 1900-80, with a special interest in Hammer, Ealing and British horror/thrillers of the 40s/50s/60s. London Underground 1944 wartime poster by Walter Ernest Spradbery, sold for £500 at Bonhams. 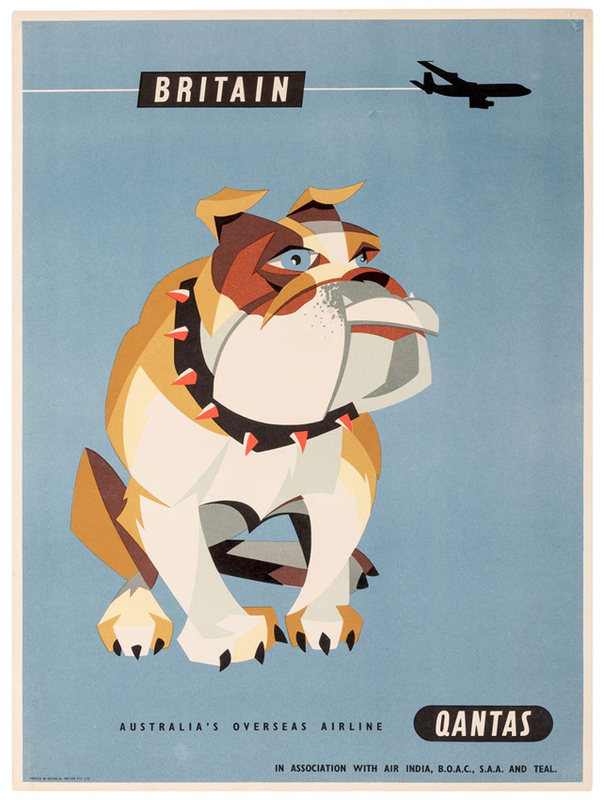 After our mention of the Qantas bulldog poster above, another kind of bulldog spirit is evident in a series of five fascinating lithographic posters dating from 1944, when Britain had weathered the worst of the bombing (although V bombs became a new terror). Sold for a low-estimate £500 in Bonhams’ Decorative Art and Design auction on October 10 held in Knightsbridge were designs promoting the London Underground which also served as a symbol of defiance, depicting views of landmarks in the capital surrounded by ruins, and sometimes damaged themselves, but certainly still standing. 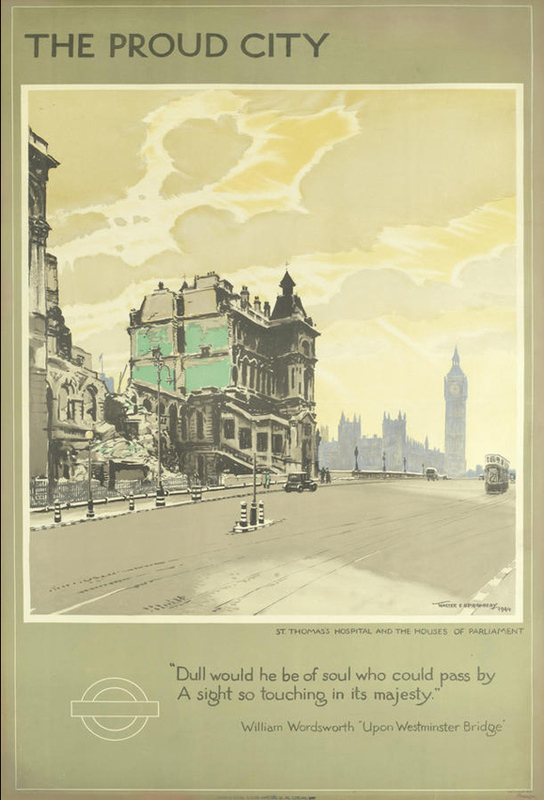 The poster shown here titled The Proud City features the damaged St Thomas’s Hospital with the Houses of Parliament across the Thames, with a verse from by William Wordsworth below: ‘Dull would he be of soul who could pass by a sight so touching in its majesty’ (from ‘Upon Westminster Bridge’). By Walter Ernest Spradbery (1889-1969), the other subjects are the Tower of London, St Clement Danes, Temple church and Chelsea Power House.